Ocean has a strong artistic bent and is always producing art works. This week she brought home her ceramic pieces from school. She has a great eye for color and shape and they are some pretty impressive dishware from an eight-year old. Our school’s art program is excellent and it is rare that a second grader would have the opportunity to produce this many ceramics. Nadia and I attended Oliver’s parent teacher conferences last week. He is such a cute little guy! He still writes cartoon stories of violence and technology like he did in grade 1. Ollie is shown above in front of his time machine that he and a couple of classmates constructed. He is slowly maturing and we are proud of his accomplishments. His team lost in the finals of the World Cup Soccer tourney at school in penalty kicks, but he handled it well. I loved his friend Noah’s story about Oliver’s trip to Guam. Hilarious! Ocean recently has been taking vocal lessons at school and it culminated with a concert. You can see a bit of the video below. She really likes singing, although I think she inherited my lack of musicality. It was very special to watch her perform. 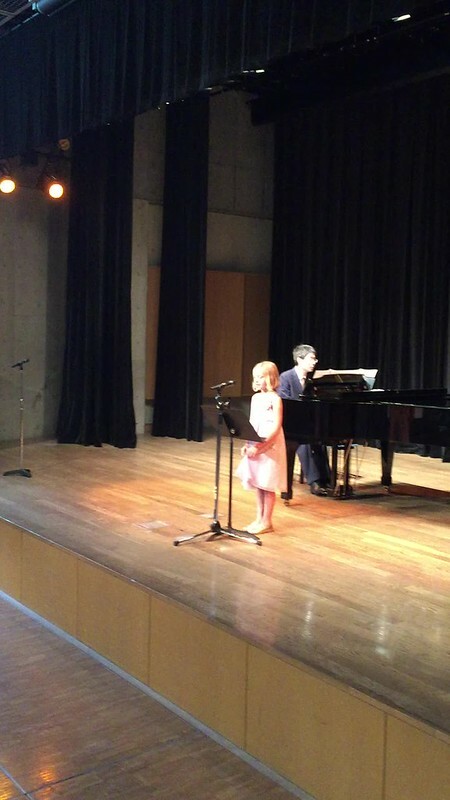 She also did a duet with an older student. I’ll link to the full concert when it goes online. Ocean was a bit nervous at the start, but felt more comfortable as the song went on. Performing and presenting oneself is so important for one’s development. Good on ya Ocean!